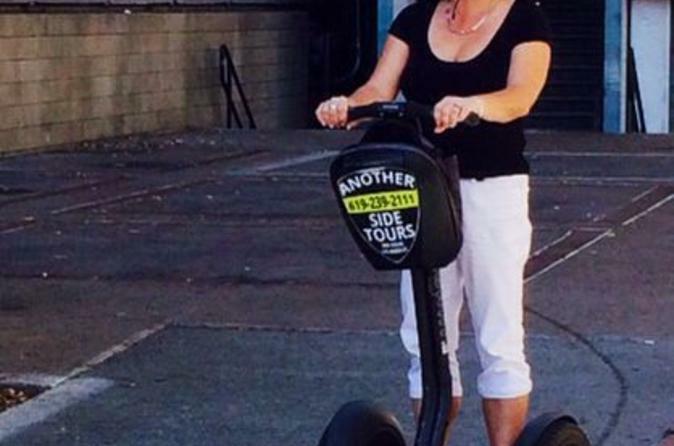 Explore San Diego by Segway on this comprehensive 2-hour tour. Led by a local guide, you’ll learn about the city’s major landmarks and history while passing top attractions like Balboa Park, the USS 'San Diego' Memorial, Petco Park and the historic Gaslamp Quarter. Snacks and beverages are included along the way, as well as a brief safety session to ensure that you feel completely comfortable hitting the streets on your Segway. 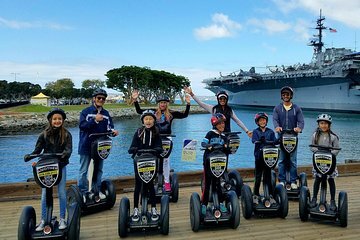 Your 2-hour tour will begin in the historic Gaslamp Quarter, where you’ll get comfortable maneuvering your Segway with help from your guide. Then, hit the streets! Absorb the bustling atmosphere of the restaurants and shops in the Gaslamp Quarter. Head through Chinatown and see the home of San Diego Padres baseball team at Petco Park. Your guide will provide fun and factual commentary about the city’s history and top attractions as you go. Admire seaside views as you cruise past the Navy Pier, where the air craft carrier of the USS Midway now serves as a maritime museum. Check out the USS San Diego Memorial, used during World War II. From there, explore the Urban Trees exhibit at the Port of San Diego, which incorporates impressive sculptures from 30 artists. Then, glide over to the sprawling 1,200 acres (490 hectares) of Balboa Park, where you’ll pass the San Diego National History Museum, San Diego Museum of Man and the San Diego Museum of Art. Stop to smell the roses at a botanical garden with over 1,300 plants, and get a glimpse of the galleries and working artist studios in the Spanish Village. Snacks and beverages will be provided throughout the course of your trip to help you refuel as needed. At the end of your San Diego Segway adventure, your tour will conclude at its original departure point. Had a great time and Seth was an awesome tour guide. Highly recommend taking this tour!! Awesome tour, I'd highly recommend. Downtown San Diego is the perfect place for a Segway tour too spaced out for a walking tour yet not sprawled out so much that you need a motor vehicle. The tour covers most of the major tourist spots of downtown including the Gaslamp district and Petco park, the USS Midway, little Italy, and Balboa Park. Not enough time to really explore each attraction, but enough to get a good feel for the city and what it has to offer. Our groups tour guide was John, he was entertaining and knowledgeable of the city, so I would recommend joining one of his groups if it's an option. Fantastic tour. Great guide Keana. We had a great time on the Segway Gaslamp tour. Our guide Keanna did a great job, showing us how to use the segways and gave us a great and educational tour. We would definitely recommend this tour and Keanna as a guide. Our tour was the best Segway tour we have EVER done. John, out tour guide, was great. We will definitely be back and we want John to give us another tour!! John Sobo? was the perfect tour guide - careful, knowledgeable, and fun. Great tour! The Segways were fun and easy to learn. Caroline was a great hide. A must for your trip to San Diego. What a great way to see the city! This was our first activity in San Diego. We had never been on Segways before, so we were a little nervous. We were shown a "how-to" video of a little stick figure that kept landing on it's face, so I was not feeling very confident. As soon as I stepped on the Segway, I realized how easy it was to control. Ryan, our guide, was fantastic and the tour took us all over the city including the Harbor, the Gaslamp Quarter, and Balboa Park. The tour lasted approximately 2 ½ hours and it was well worth the money! Tons of fun! The tour guide was superb, knowledgeable, and personable. The group was small enough that we got personal attention. The tour was just great. Thought I would have trouble as I have just had back surgery 5 months ago and don't have good balance but it was no problem. Our guide Jon was fantastic - great knowledge of the area and very good at making everyone comfortable on the segways. I would highly recommend this tour.